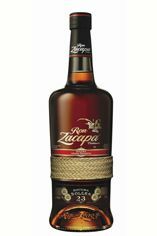 Ron Zacapa Solera 23 contains a blend of rums from 6 to 23 years old. This is a wonderfully intricate rum with honeyed butterscotch, spiced oak and raisined fruit, showcasing the complexity of the sistema solera ageing process. Its appearance is light mahogany, with the tones of long barrel ageing at the rim and long, slow legs clinging to the glass. On the nose: A soft start which develops complexity in the glass; sweet aromas of caramel, vanilla, cacao and butterscotch, combining with layers of flavour indicative of the different barrels in the solera process; sherried notes of caramelised, roasted brazil nuts and toasted hazelnut, and the characteristic rounded toffeed banana and dried pineapple of ex-American whiskey casks. On the palate, it is complex, generous and full-bodied, with a sweet honeyed viscosity atypical of an aged spirit; a great depth of raisined fruit and apricot preserves, building to an intense heart of savoury oak, nutmeg, leather and tobacco with notes of coffee and delicately sweet vanilla, balanced with a spicy touch of cinnamon and ginger on the pleasantly astringent finish; truly a rum for the discerning palate.